Bryce Menzies - "Have fun. Work hard. Win races." Rob MacCachren ... "I'm A professional race car driver......on the dirt!" 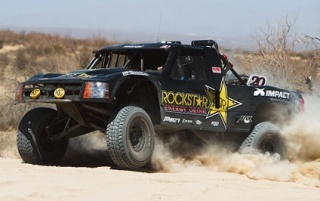 , Major sponsor: Rockstar Energy. Mark Workentine - "Going Fast, Giving Back"
B.J. Baldwin - "Four off road racing Championships and counting. Just like any other job except the office is always dirty and it shakes all day long."